While I was traipsing the Pacific Northwest two weeks ago, Quilt Market was taking place in Pittsburgh. 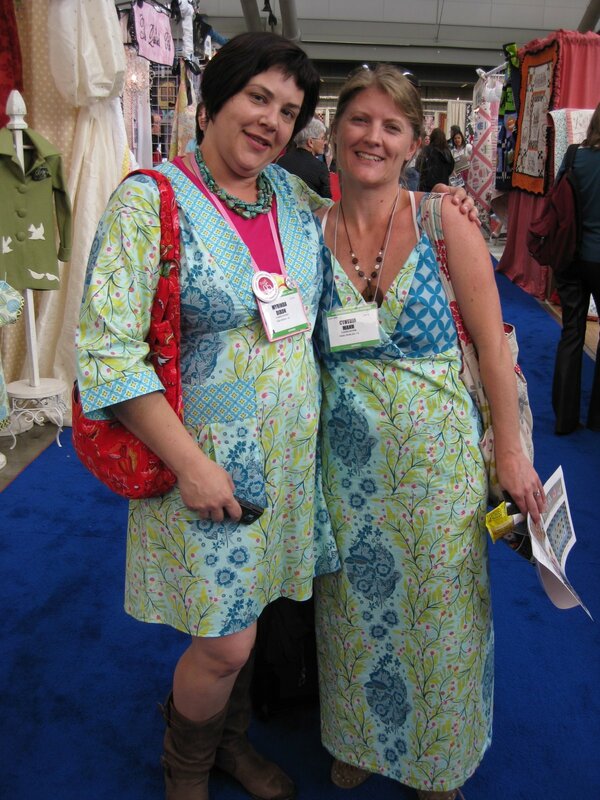 Fabricworm owner Cynthia (a blog sponsor) wore the dress I made for her (she’s on the right). She seemed to find her fabric twin while there! Check out her blogger blog for other photos and sneak peaks of what’s going to be out soon. Sevreal months ago I dusted off my J-School diploma and did a little interview with her. How did you start selling fabric? I kind of fell in to selling fabric. I initially thought I would make things to sell, and set up wholesale accounts, then realized that I really was addicted to the fabric itself, and I wanted to have every color and every print. The only way I could do that was if I were to sell it too. More on that later. Also, I was really inspired to sell fabric when I found it a little difficult to find Japanese Imported fabrics like Echino, and Kokka. I thought that it might be a good idea to sell these online, and help bring them into the mainstream more. Plus Etsuko Furuya of Echino is my Favorite Designer of all time! How can your cottons be used in clothing choices? I think that it can sometimes be difficult to sew garments with quilting cotton. They just don’t drape the same as rayon or polyester blends. I think that some of the Amy Butler patterns are perfect examples of ways to use fun quilting cottons in garment applications, The Anna Tunic and the Barcelona Skirt are great examples of fun garments that work well. I love the idea of simple shirt dresses like those from the fifties would work well, anything that hangs straight and can be belted for a more flattering look. How do you choose fabric to stock in the store? I choose the fabrics that I sell completely on instinct and truthfully, mainly personal preference. I do see everything that is coming out new, and then I decide what really suits my customer. Most of which are a similar demographic as myself. I’m a WAHM (Work At Home Mom) and many of my customers make handmade goods that they sell on Etsy, like children’s clothes, handbags, and quilts. What are the big trends you see for spring? As far as trends go, it really seems like a lot more of the same for now. Woodland themes, with deer, owls and mushrooms are still popular, spawning originally from Japanese Import fabrics that have become more and more popular. I think we will also continue to see a lot of bold brights and also simplified graphics. I personally would like to see more Mid Century Modern graphical prints like those from Anna Griffin’s New Line Darcey. I think a palette of charcoal, aqua, and orange would be fantastic. I’m working on a few designs of my own, and am hoping to launch my own Fabric Line when I have more free time. How do you keep yourself from stashing fabric when it’s all around you? Well, that’s funny, because I don’t really. I haven’t made any scrap packs, because I can’t part with them. They are the lovely offspring from my original bolts. They are my babies, I’ve claimed them as mine, and someday if I ever can find the time, I swear I will do something with them. LOL. /you really should see the stacks. I’m running out of room for sure! What a sweetie you are to make a dress for a friend. Love, love, love cheery aqua colors. There’s another FW on Craigslist. Thank You so much for posting the interview. I have to say I broke down and did post scrap packs in my Etsy store. I was getting a little buried by them and had no choice. This is the best sewing blog on Earth!! Thank You Miss Celie Pants! Wow there’s no way I could own a fabric store. Too much temptation. The dress looks great!!! Congrats. Hope you enjoy it.